Several birthdays today with lots of free fiction. Locus Award nominated and Aurora Award winning author Karl Schroeder is known for his far-future science fiction novels, such as Ventus and Permanence. 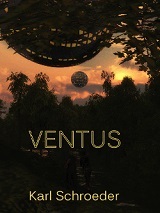 • At Author's Site: Ventus. "The inspector who built this place had been hoping his proximity to the wilderness would win him favor with the Winds. He used to stand on the forest-ward wall, sipping coffee and staring out at the treetops, waiting for a sign. Jordan had stood in the same spot and imagined he was the inspector, but he was never able to imagine how you would have to think to not be scared by those green shadowed mazeways. That old man must not have had bad dreams." • At StarShipSofa: "Mitigation" with Tobias Buckell. The bestselling author of and the Vampire Diaries and the Night World series, Smith writes YA Urban Fantasy / Paranormal Romance. She has numerous YA books in print and has several free stories at her website. * Sources disagree on year. "An Untold Tale: Elena's Christmas"
"Matt and Elena - First Date"
"Matt and Elena - Tenth Date: On Wickery Pond"
"Jez and Morgead's Night Out"
"Ash and Mary-Lynnette: Those Who Favor Fire"
The promising author of Transpecial, Povey has recently been published in Analog, Cosmos, and other notable Speculative Fiction Magazines. Expect to read more of her works in the future. On her website, She has made it easy to find the free fiction she has had published online. Treaty – this story brought to you by the Australian popular science fiction magazine Cosmos. Mannequins – brought to you by Silver Blade. Geese – a sweet story about Beauty and the Beast, 50 years on. Thank you Kate Wolford and Enchanted Conversation. Linda Ever wondered how Beauty’s sister felt? More from Enchanted Conversation. The Emperor’s Grandson A brief trip to ancient Rome (Comets and Criminals). Contact Who is the real monster? Bright Ladies A brief glimpse into a steampunk world. Air pirates! 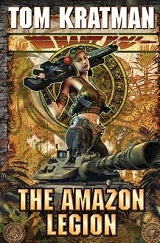 A military science fiction author, Kratman is also an army veteran who retired in 2006 and became a full time writer. He has several published novels, a few of which are freely available. • At Author's Site: "Big Boys Don't Cry." "Melcon awaits. And indeed that is the entire cause of the present conflict. Both the Shang and the Human Concordiat agree: Humanity must stand united against the Melconian threat." Watch on the Rhine. with John Ringo. Yellow Eyes. with John Ringo. "The Troubadour" Science Fiction. 1951. 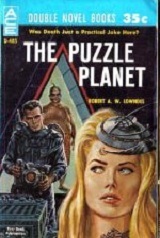 "The Fourth Invasion" (As Henry Josephs) Science Fiction. 1956.